Includes: Whānau Ora Primary Health Services, Rheumatic Fever Prevention Programme in Schools, Breast & Cervical Screening Services, Asthma management and the Manaaki Manawa Heart Care Programme. The nurses often make referrals to other services to ensure all needs of the patient are met. Nurses go out and meet clients in all areas of our community. For mothers and babies. Services include: Tamariki Ora Well Child Service, B4 school checks and a maternity support service. Tamariki Ora also conduct unique kaupapa Māori “Te Mata ō Mua” Antenatal 2 day Wānanga. The benefits of wahakura in preventing SIDS are promoted at the wānanga and hapū māmā often get the opportunity to make one. All dental services. Our dentists Wiremu and Shin are both now based in Kaikohe. We offer a full dental service for all whānau at reasonable prices. We also offer free dental treatment to youth aged 13-17 years. Make an appointment by ringing 0800 644 864 or with one our dental units when they are at your school. We travel to Bay of Islands College, Northland College and Okaihau College. We prepare WINZ quotes and can arrange dental treatment for low income adults (conditions apply). NHHT’s medical centre operates with a GP and Practice Nurse on the Kawakawa Office site. This clinic in the Kawakawa Office offers mirimiri (massage) with karakia and whitiwhiti kōrero (cultural support). Situated next to Bay of Island College, the clinic delivers a support service to youth up to 24 years that covers all areas of the health and wellness spectrum i.e. te hauora o te tinana, hinengaro, wairua, whānau and te ira tāngata. If it’s difficult for whānau to come to us then we go to them. Ever on the look out to reduce barriers to health support for our whānau, we run clinics at Motatau, Waikare, Russell, Pipiwai, Rawhitiroa, Tautoro, Whakapara and Mangakahia monthly and bi-monthly. We try to take a range of health and social services clinicians, nurses and support staff and of course our GP Dr Tamara Birchall. 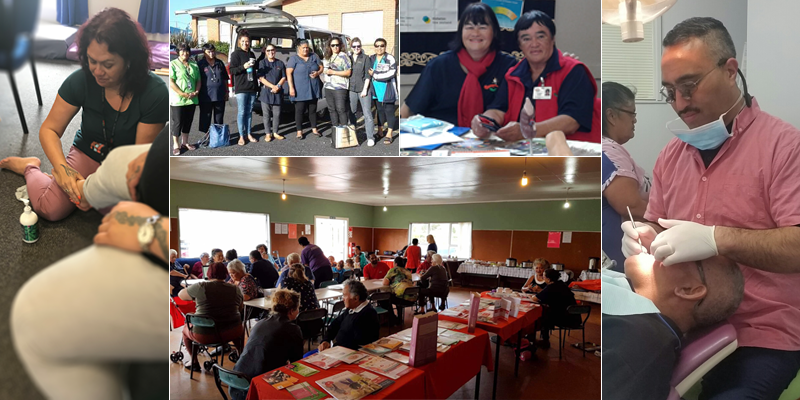 Free health checks, referrals, specialist advice and on the spot services are provided plus a kapu tī!